Para leer este articulo en español dale click aqui. Dominga Lucas-Pérez is a member of the community on Grandville Avenue. Here we highlight the voices of indigenous members of the community who face greater barriers at accessing basic needs due to a lack of resources in their primary language. When asked how to spell her name correctly, Dominga Lucas-Pérez proudly pulls out her Grand Rapids Public School Volunteer badge from her knitted purse. She carries the badge with pride. She explains she has earned the badge after Liliana’s first day in Kindergarten. To her, this badge is a sign that she belongs to the Grandville Avenue community. Liliana is Lucas-Pérez’s oldest daughter, an eighth grader at City Middle School, a school which Liliana enjoys immensely, though this was not always the case. 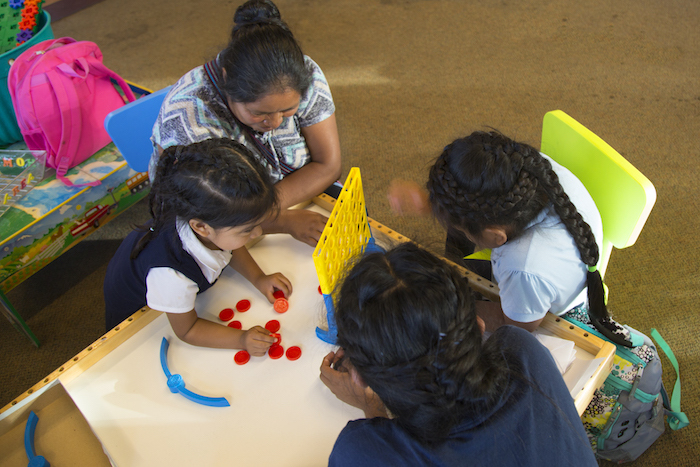 Liliana had a really hard time separating from her mother when she first began kindergarten. Lucas-Pérez eased the transition by staying with Liliana during the first couple of hours of school. This served a double purpose. Not only was it a way for Liliana to feel comfortable with the environment, but it also became an opportunity for Lucas-Pérez to practice speaking her English and Spanish (which is not her native tongue), as well as to build meaningful relationships with her daughters’ teachers. After hearing that Lucas-Pérez is from Guatemala many assume her primary language to be Spanish. However, Lucas-Pérez’ first language is actually called, “Mam.” Lucas-Pérez was born and raised in Todos Santos, a county of the state of Huehuetenango in the country of Guatemala. She is a part of a small and vibrant indigenous Mayan community in Todos Santos Cuchumatán. Mam is the fourth most-common indigenous language, with about a half million speakers in the world. Mam is not exclusively found in Guatemala; it can also be heard spoken in Chiapas in eastern central Mexico. Lucas-Pérez remembers her first attempt to order a cup of coffee at a Mcdonalds in Grand Rapids. Translation: When we first got here we didn’t know how to even ask for a cup of coffee. We had to point with our fingers, and if the cashier happened to be patient, then we could order what we wanted--if not we just stayed quiet. Liliana, Cyndi and Yulimar. According to data from Grand Rapids Public Schools, there are a total of 75 students whose families have self-identified a Mayan language as their primary language. Out of these 75, the highest concentration of students is found at Cesar Chavez Elementary School (21 students). Translation: People sometimes confuse Mam with Spanish. Lucas-Pérez also adds that Mam does not employ female and male pronouns like he and she. She explains that when she first arrived in 2000, it was a little easier because her partner Matías knew Mam, Spanish, and English well, and he could help translate for her. However, when Matías passed away in a tragic work accident three years ago, Lucas-Pérez has had to raise their three young daughters on her own with few resources in her own native language. Translation: I am here for my daughters because I want them to become doctors, nurses or some sort of professional. Any profession as long as they have one. In spite of the language barriers Lucas-Pérez has faced, she has persisted. She has made herself an integral part of the community on Grandville Avenue. The school staff at César Chávez, where her two youngest daughters, Yulimar and Sindi are enrolled, knows Lucas-Pérez as a volunteer extraordinaire, Lucas-Pérez believes the only way she can ensure her community thrives is by remaining involved. Domingo Hernández-Gómez, the Director of the Bob and Aleicia Woodrick Center for Equity and Inclusion at Grand Rapids Community College, explains that there is perceived negativity around speaking an indigenous language. Hernández-Gómez’s primary language is Tzeltal, a Mayan language spoken in five countries of Central America. Hernández-Gómez spoke Tzeltal until he was eleven years old when he was exposed to Spanish in school. “In [an] indigenous population there is a feeling of shame when you don’t speak Spanish, because of the fear of being judged that you are not educated, or you are basically dumb, ignorant,” says Hernández-Gómez. The Spanish language is not a native language of Latin America, but one brought by Spanish colonizers in 1492. Today it is the official language of many countries in Central and South America, and there has been very little acknowledgment of the indigenous communities and languages original to these lands. Unlike Hernández-Gómez, who had the opportunity to receive schooling, Lucas-Pérez did not have the same kind of educational opportunities he had. She was only able to complete three years of school in her village in Todos Santos, and after third grade, she had to go work in the fields to help support her family. Lucas-Pérez has always been passionate about education, but access to educational opportunities was not something her family could provide her. “Cuando yo estaba en Guatemala cada alumno tenía que llevar piedrecitas para hacer el muro de la escuela. Y los que tienen dinero pueden ir a la escuela y los que no tienen dinero entonces no es obligatorio ir a la escuela,” says Lucas-Pérez. Translation: When I was back in Guatemala every student had to carry their own bricks to build the walls of the school. It was not mandatory for kids to go to school, so only those who had money would go. The access to opportunities for education is one of the reasons Lucas-Pérez remains in the United States. If she had stayed in her village, she explains that her daughters wouldn’t have been able to enroll in the kind of education they have here, let alone have access to learning three languages. All three of her daughters speak Mam, Spanish, and English. At home, Lucas-Pérez speaks Mam with her daughters, except when they are working on their homework for school. “Yo me siento con ellas y ellas me enseñan lo que significa cada cosa que están leyendo,” explains Lucas-Pérez. Translation: I sit with them while they are doing homework, and they also show me what each part of their reading means. For Lucas-Pérez, developing relationships with her community means being a bridge with other mothers who also don’t speak Spanish as a first language. She believes that it is her duty to share her knowledge of resources with others. “Yo he enseñado a muchos como ir en el bus, como ir a la clínica Cherry, como ir a pagar la basura, como ir a inscribirse a la escuela,” says Lucas-Pérez. Translation: I have taught many how to ride the bus, how to go to Cherry Clinic, how to pay for garbage collection at the city building and how to register their kids for school. Chad Patton, Director of Customized Workplace English at the Literacy Center of West Michigan explains that many people assume that members of the southwest community of Grand Rapids have 100 percent Spanish language proficiency and are able to read and write in this language. However, often that is not the case, explains Patton, as they have had little access to a formal education in the Spanish language. According to Patton, our community’s overall misperception of the Latinx experience is part of the issue in the continued erasure of the experience of indigenous folks from Latin-America. Their identities as indigenous people do not necessarily mirror the “typical” Latinx experience portrayed in the media. This past July, the Literacy Center of West Michigan began offering basic Spanish language courses for individuals in the community whose primary language is not Spanish. “We kept running into individuals who could not read or write in Spanish even though they spoke Spanish, and the best way to help teach them English was by helping them improve Spanish,” says Patton. The class is offered on Tuesday evenings at Clinica Santa Maria, located on 730 Grandville Avenue SW. For those interested in attending, please register by calling Patton at: 616-459-5151 ext. 44. One of the ways, Lucas-Pérez has been able to navigate resources is through her daughter Liliana, who has always been willing to translate for her mom when she doesn’t understand. Liliana has learned Spanish and English through the bilingual immersion program at César E. Chavez Elementary School. “Fue gracias a Liliana que yo aprendí a montarme en el bus, y el horario, y ahora yo me voy en bus a recoger a Liliana de la City,” says Lucas-Pérez. Translation: It was thanks to Liliana that I learned how to ride the bus and the bus schedule. Now I take the bus to pick up Liliana from her school at City Middle School. “These families tend to rely on their kids to help them in the process of translation, and this can take a toll on the kids. This is why it is really important to have counseling resources and support for these kids. The easiest way to make others like Lucas-Pérez feel welcome is to smile and use body language to communicate belonging", shares Hernández-Gómez. “Saying “Hi” helps someone know that they are welcomed here,” explains Hernández-Gómez. Lucas-Pérez echoes Hernández-Gómez sentiments, and says she is always interested in practicing her Spanish and English with native speakers. “Yo me siento orgullosa de mi. Si tu me dices Dominga no se dice eso en español se dice así, y yo no me siento mal porque me estas haciendo un bien,” says Lucas-Pérez. Translation: I am proud of myself. If you tell me “Dominga that's not how you say it,” and you correct me, I don't feel bad, because I know you are doing it for my own good. “Yo primero mi sueño pedirle a Dios que me de muchos años más. Yo quiero ver a mis hijas tener su graduacion,” says Lucas-Pérez. Translation: My dream is to ask God for many more years. I want to be able to see my daughters graduate. Lucas-Pérez’ persistence is a product of her need to fight against colonialism and structures built to erase indigenous voices like hers. Structures aim to center whiteness. Lucas-Pérez persists against these structures and fights to give her daughters the chance at better opportunities. On The Ground GR is a Rapid Growth series. This series will highlight and celebrate the communities found touching along the Grandville Avenue of Grand Rapids. Over the next few months, On The Ground GR journalists will be knocking on doors and getting to know the neighbors and community members. We will dive deeper into topics concerning this neighborhood's residents and stakeholders while celebrating the diversity and strength found in this area. We are on the ground listening and want to celebrate the community's unifying spirit of positivity and vibrancy. You can follow On The Ground GR's work via Twitter (#OnTheGroundGR @rapidgrowthmedia), Facebook and Instagram. To connect with On The Ground GR's editor, Michelle Jokisch Polo (read more about Michelle here), you can email her at michellejokisch@gmail.com and follow her on Facebook and Instagram. 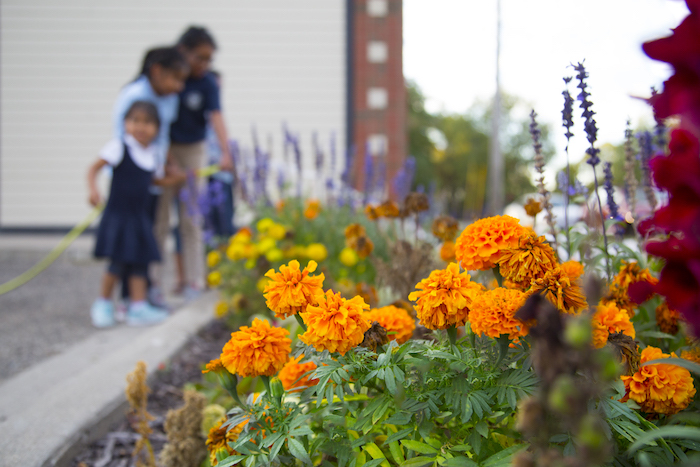 On The Ground GR is made possible by The Frey Foundation, The Grand Rapids Community Foundation and the Steelcase Foundation organizations working to guarantee all communities thrive. Photography by Dreams by Bella.